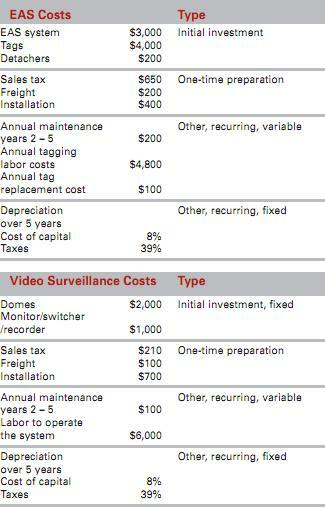 Home Loss Prevention Technology How Do You Calculate ROI in Retail? At some point in your retail loss prevention career, if you haven’t done so already, you will be called upon to help make procurement decisions on new technology, such as electronic article surveillance (EAS) or video surveillance. 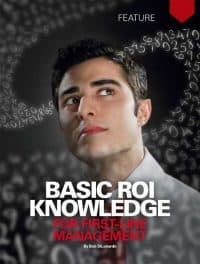 While you may be most interested in the features, functions, and benefits of the technologies, your CFO will be more interested in the oft-used cliché, “bang for the buck.” So, how do you calculate ROI in retail? What type of analysis (simple or complex) should be used? What are the costs and benefits associated with this project? How long will it take before the costs are recovered? Will the project turn a profit? If so, how much? How does the profitability of this project rank against all others? Simply stated, an ROI analysis determines the amount and rate (percentage) of anticipated or earned profit, if any, from an investment. A pro forma analysis is conducted in the planning stages of a project using cost and benefits estimates. The idea is to calculate an expected or anticipated return based on well-reasoned assumptions. ROI analysis is also used after a project’s implementation in order to calculate the actual return and to see whether or not the investment met financial expectations. There are basic and comprehensive analytical methods. The basic methods simply calculate a time horizon for cost recovery (payback) in months or years, or a simple return on investment percentage (what percentage of the cost will be, or has been, recovered). Payback ignores the concept of the time value of money, meaning a dollar that you have in your hands today is worth more than the promise or expectation that you will receive a dollar in the future. Payback also ignores any costs or benefits beyond the first year. Because of these limitations, we will not employ a payback calculation in this analysis. ROI results compared to a benchmark or “hurdle” rate (a rate of return below which the project will be rejected). Net Present Value. Discounted cash flow analysis is a method of valuing a project using the concepts of the time value of money. All future cash flows (incoming [benefit] and outgoing [cost]) are estimated and discounted at a required rate of return to give their present value. The sum of all discounted cash flows covering the time horizon is the net present value (NPV). A zero NPV means the project repays the original investment and covers the required rate of return—essentially a breakeven. A positive NPV indicates a profit (over the required return), and a negative NPV indicates a loss. In capital budgeting, the discount rate used is called the “hurdle rate” and is usually equal to the incremental cost of capital. The ROI on a project must exceed the hurdle in order to be judged worthy of an investment. When choosing among a number of investments, the CFO looks for the highest NPV. Internal Rate of Return (IRR) is the rate promised by the project over its useful life. It is sometimes referred to as “yield on project.” The IRR is the discount rate that will cause the NPV of a project to be zero. Once the IRR has been calculated, it is compared to the company’s required (minimum acceptable) rate of return. If the IRR is equal to or greater than the required rate of return, then the project is acceptable. If not, it is rejected. Often, a retailer’s cost of capital is used as the required rate of return. The logic is that if a project cannot provide a return at least as large as the cost of the investment, then it is unprofitable. Both NPV and IRR are readily available formulas in spreadsheet programs. There is no need to calculate them by hand. Why Is ROI Analysis Important? First, an accurate return-on-investment analysis prohibits unprofitable decisions. A well-reasoned, thoroughly researched financial justification tends to inhibit emotional decisions, and promotes “buy-in” for the project, and helps the loss prevention department make a professional case to senior management for accepting and implementing new technology for retail stores. Proper ROI analyses start with a thorough compilation of all costs and benefits that could possibly be associated with the proposed project. While each project may be different, the costs can be divided into three categories—investment, one-time preparation, and other. The main investment is the cost of any hardware or software licensing fees. These costs will most likely be depreciated (hardware) or amortized (software) over a fixed time horizon established in our generally accepted accounting principles (GAAP). One-time preparation costs include sales taxes, freight charges, and the cost of site preparation and installation. These costs are added to the total investment for depreciation/amortization purposes. Other costs include such things as the labor required to operate or manage the project, maintenance, IT expenses, or any other incidental expenses. These costs may be one-time or annual, fixed or variable. Generally, they are not included in the investment, but are “expensed,” meaning they are accounted for in full when they are incurred. A “hard” cost, such as the cost of the EAS tags or other retail theft prevention system, is objective and easily acknowledged and quantified. All hard costs and benefits should be included in the ROI analysis. “Soft” costs/benefits are those that are more subjective estimates rather than precise calculations. For example, an anticipated improvement in labor productivity may not be as easily acknowledged and quantified. The most accurate ROI analyses rely upon “hard” costs as exclusively as possible and only include “soft” costs where the circumstances can be clearly understood and agreed upon by the project participants. A reduction in inventory shortage is usually the largest and most important potential benefit from loss prevention investments. If you think about it, we are making investments in security programs with the intention that shortage will be reduced from current levels, or that the countermeasures will keep shortage from rising to unprofitable levels. Shortage reduction and control is loss prevention’s raison d’être. We must be able to accurately estimate the impact that the project will have, or has had on shortage. The shortage performance graph below plots the inventory shortage results in a retail apparel store that had experienced a significant increase in shoplifting. After installing EAS, the results were measured after the first year, and future results were estimated over the balance of a five-year time horizon (years +2 through +5). In this example, EAS is the only countermeasure that was used, so any change in shortage can be directly attributed to its deterrent qualities. The horizontal (X) axis measures time, in years, and the vertical (Y) axis measures shortage as a percentage of sales. 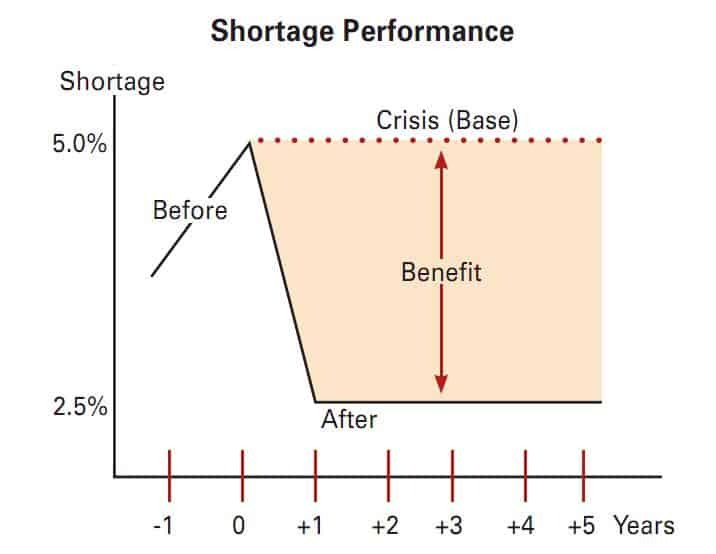 Under this scenario, shortage had been rising and the crisis point (year 0) was reached when shortage reached 5 percent of sales. EAS was installed at the end that fiscal year (year 0) directly after the annual inventory was taken. At the end of the first fiscal year of EAS usage (year +1), shortage dropped by 50 percent to 2.5 percent of sales. Management assumed that shortage would remain at the lower level over the rest of the time horizon. The dollar value of the reduction in shortage over the five-year time horizon is the financial benefit that will be entered into ROI calculation for the project. Assume that the store’s annual sales are $1 million. Assume further that shortage would have stayed at its crisis point of 5 percent (dotted red line) had EAS not been installed. Without EAS, annual shortage would be $50,000. Since the EAS installation, annual shortage dropped to 2.5 percent ($25,000), and with proper management, would remain at that lower level over the subsequent four years. So, the financial benefit gained by the use of EAS is the difference (at cost) between the shortage at the crisis point before the installation (5 percent) and the average rate of shortage after the installation (2.5 percent)—a savings of $25,000 at retail per year. To arrive at the cost of shortage, we must multiply by the cost of goods sold (COGS), in this case 55 percent. By “costing out” the change in shortage, we are treating it (accounting-wise) the same as we treat the cost of the EAS equipment, making the results “apples to apples.” This calculation will be shown later in the real-world example. Can the amount of incremental sales be accurately estimated? How are incremental sales valued in the ROI analysis? Thanks to the work of retailers and academic researchers, studies have shown that there is an inverse relationship between item-level shortage and sales. In other words, statistics show that when shortage in certain items decreases, sales in those items increase. The range of the sales increase is wide, and at this point this type of benefit has to be considered “semi-soft,” meaning that while there is empirical proof that incremental sales occur, the estimate is still subjective, unless the retailer has conducted its own study. For this reason, an estimate of the impact of incremental sales will not be used in the real-world example analysis below. Calculating the financial benefit of an incremental sale, however, is straightforward. Doing so requires an additional piece of information—the “gross margin” percentage of the items in question. Suppose the EAS project results in provable incremental sales of $50,000 per year at retail, and the gross margin percentage of those items is 19 percent. To calculate the gross margin impact of the incremental sales, multiply them by the gross margin percentage ($50,000 x 19% = $9,500). This gross margin impact is the financial benefit that would be included in the ROI analysis. Labor savings can be included when an investment in technology results in a reduction in labor hours. Labor savings is a “hard” benefit that is calculated by multiplying a wage rate by the number of hours saved in the project. Typically, if labor hours are reduced, then employee benefits are reduced, as well. Often called a “benefits component,” it is usually expressed as a percentage of the base wage rate. Ask your human resources department for the rate. If the benefit component rate is 18 percent, and the hourly base wage rate is $10.00, then the benefit component is $1.80 per hour, and the “fully burdened” wage rate is $10.00 + $1.80 = $11.80. If the investment saves 120 hours of labor per year, then the labor savings benefitin the ROI analysis is $11.80 x 120 or $1,416 per year. Productivity improvement comes in many forms, but is not easily quantified. Suppose that an investment in video surveillance equipment allowed loss prevention agents to apprehend 15 percent more shoplifters per year than previously. Suppose further that the average value of each bust was $75.00, at retail, in recovered merchandise, and the number of annual cases had been 80 per year. A 15 percent increase in productivity allows the agent to work about twelve more cases, and results in an additional recovery of $900 at retail per year. Multiplying the amount of the recovery by the COGS of the items (55 percent) provides a benefit of $495 to the ROI analysis. The following simple real-world example will supply the data necessary to explain the analytical concepts discussed above. Shortage Reduction Benefit Calculation. In the EAS example, management expects shortage to decrease by 50 percent from 5.0 to 2.5 percent of sales and remain at the reduced level for the five-year time horizon of the project. The annual sales for the store is $1 million and the COGS for the protected items is 55 percent, so the annual ROI benefit from the estimated reduction in shortage is $13,750 per year. In the video surveillance example, management expects shortage to decrease by 35 percent from 5.0 to 3.25 percent of sales and remain at the reduced level for the five-year time horizon of the project. The annual sales and COGS are the same, so the annual ROI benefit from the estimated reduction in shortage is $9,625 per year. Will either countermeasure be profitable? How long will it take to recover the investment? The Verdict Is EAS. Both countermeasures are profitable because the NPV calculations are greater than zero. The IRR calculations suggest that both generate a significant return over and above the 8 percent cost of capital used as the discount rate. Note, however, that the NPV for EAS ($15,400) is almost triple that of video ($5,900), and the IRR for EAS (65.08%) is almost 10 percentage points higher than that of video (55.12%). Based on these metrics, EAS is the countermeasure of choice. There are a couple of reasons. First, the assumed shortage reduction for EAS (50%) exceeded that of video (35%). Second, the annual costs for video in years two through five are higher. This article was originally published in 2010 and was updated February 19, 2018.